When I think about all the things a military issued watch should be (robust, legible, functional), no watch comes as close to perfection as the 1970s Benrus dive watch. Its super-solid case, highly-readable dial, and simple but functional features make it a real classic among military and dive watches. Today we’ll take a look at what makes these watches so special. 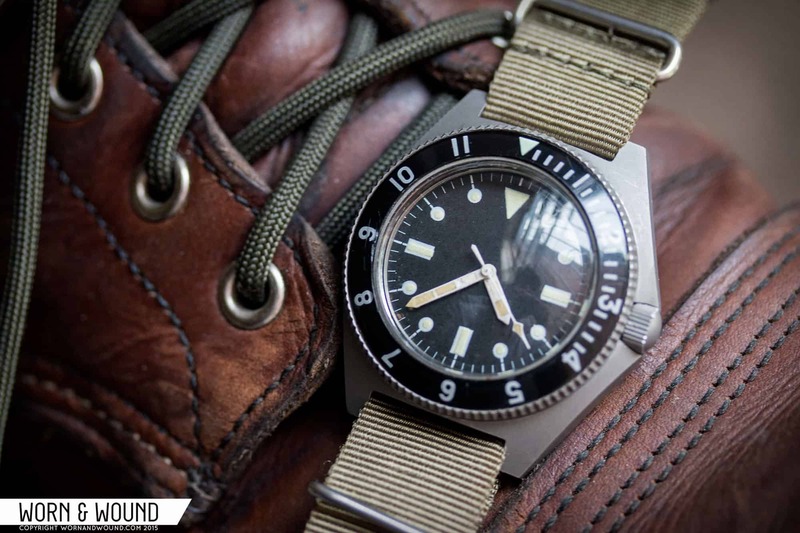 In the early 1970s, while the British were issuing their now-famous, essentially off-the-shelf Swiss military dive watches, American forces wrote MIL-W-50717, a military specification that outlined all the design details they were looking for in a diving watch. Benrus, who had been producing field watches for the US military since the early 1960s, answered the mail with the watches you see here. These watches had everything divers and other combat units needed and nothing they didn’t. The thick steel one-piece cases measured in at 43 mm wide and 16mm tall, and made the watches impervious to disruption from the bangs and bumps associated with military operations. That solid case and thick crystal on top gave the watch 1200 foot (about 365 meter) water resistance – pretty impressive for its time. Housed safely inside is an automatic Benrus GS1D2 movement – a 17-jewel automatic Benrus-modified ETA 2620. In top form, the movement will run for 40+ hours on a full wind. The bezel is coarsely notched, making rotation easy for the wearer, even with gloves on. The acrylic bezel insert has numeral marked hours 1 through 11 with minute dash markings from 1 to 20. The insert has a beautiful three-dimensional effect caused by the markings being painted into recesses on the under side of the insert. With guidance from the military specification, there were two types of these watches produced: Type I and Type II. Although the Type is stamped on the back of the case (along with mil-spec number, manufacturer, NSN, manufacturer part number, contract number, production date, and serial number), telling Type I from Type II is as easy as looking at the dial. Type I’s feature lumed markers at each hour: a triangle at 12; rectangles at 3, 6, and 9; and dots at the remaining hours. Type IIs have a traditional 12/24 military dial, with small lumed triangles at each hour. There is also an unlumed version of the Type II, designated Class B, which does not have any lume on the dial or hands – they were used in locations containing delicate instruments that might be sensitive to even the small amounts of tritium contained in the lume (like on nuclear-powered submarines). Like most military watches, legibility is tops on both Type I and Type II. While I find myself preferring the simplicity of the Type I, the Type II looks more like other American milwatches we’re used to and is helpful in quick conversions from civilian to military time. These watches wear very comfortably, despite being relatively large and heavy. Fixed bars force the use of pull-through or open-ended straps, but it’s hard to find a better look than one of these on a black NATO. They have ridden the wave of milwatch popularity, which, of course, means increased prices and copycats. However, some of the remakes and re-imaginings are quite good, like the Paradive from MKII or even the Marathon Navigator. Benrus Type Is and IIs were produced for nearly a decade, from 1972 to 1980. In all, there were a little over 9,000 Type II Class As produced, along with roughly 6000 Type I Class As and about 1000 Type II Class Bs. There also exist a very small number of “sterile” Type Is – these watches don’t have any of the military stamped markings on the caseback and instead have a single engraved serial number. The collector community has mostly agreed that these sterile versions were pre-production versions of the watch that made it out into military use. Of course, watch nerds love a good story, so you’ll often hear how these watches were issued to Navy SEAL teams and other Special Operations units in the Army and CIA, since the lack of military markings on the case meant that the watch (and thus its wearer) could not be identified as American. True or not, it’s a good story, and, along with the scarcity, drives the prices of the sterile version to the top of the Benrus price list – one reportedly sold online last week for over $4000. Below that are Type Is in good condition – right now they usually go for $2000-3000, depending on condition. Type II Class As are the most common version, and today they typically bring $1500-3000, again depending on condition (expect to add a couple hundred bucks for the unlumed Class B version). As both a military watch and a vintage dive watch, the Benrus MIL-W-50717 Type I and Type II dive watch delivers high quality and great style for a manageable price (at least compared to other 1970s military dive watches from across the pond). Finding one is fairly easy – there are usually a few for sale at any given time on online auction sites, as well as in the sales pages of most popular watch forums. For more information about these watches, and for a good source to pick one up, check out the Military Watch Resource at broadarrow.net.